Korean stars team up for fans in "Heartstrings." 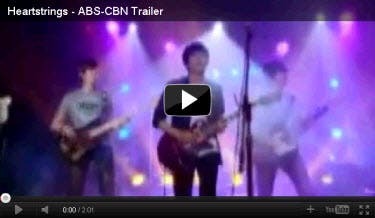 Due to insistent public demand, two of the hottest Korean stars from the hit idol drama “He’s Beautiful,” Jum Yong Hwa and Park Shin Hye, team up for the first time as two very different musicians playing good music together to the tune of love in “Heartstrings” that started airing today (2 Jan 2012) on ABS-CBN. As the granddaughter of a known traditional musician, Nicole wants to make her grandfather proud and realize his dream for her of becoming a traditional music prodigy. Thus, she majored in traditional Korean instruments in a university where she will come across Kevin, a campus heartthrob and a rock star in his own right as the vocalist of the famous band The Stupid. The two will meet at the band’s concert and the extremely opposite music majors will start of at the wrong foot. Their mutual hate to each other will lead to a showdown of their musical talents where Nicole plays classical and Kevin plays modern rock. Who will win the musical battle? As Kevin strums the guitar and Nicole plays the gangeum, can they play good harmony together? What if they used their hearts instead of their instruments? Dont miss the chart-topping Korean series filled music and romance, “Heartstrings,” Mondays to Fridays, 2:30 PM after “Happy Yipee Yehey” in ABS-CBN’s afternoon block Kapamilya Gold. Heartstrings: Will Nicole and Kevin Finally Play Good Music Together?